This species is closely related to Tsuga dumosa and Tsuga chinensis and shows intermediate characters. It occurs in the area where the ranges of these two species meet: the Lijiang Shan and mountains to the northwest (NW Yunnan) and north (SW Sichuan). In Flora of China 4: 41 (1999), T. forrestii has been treated as a variety of T. chinensis. Endemic to China: NE Guizhou (Jiangkou: Fanjing Shan), SW Sichuan, and NW Yunnan. Appears to be fairly widespread but scattered. The population has probably undergone a significant reduction (30-49%) in the recent past due to exploitation. Like the other two species occurring on the SW Plateau of China, T. forrestii is a high mountain species occurring between 2,000 m and 3,500 m a.s.l. The soils are mostly podzolized. The climate is temperate to cold temperate, with annual precipitation between 1,000 mm and 2,000 mm. It is a constituent of the montane boreal coniferous forest formation, where it is mixed with Abies spp., Picea spp., Larix potaninii, occasionally Pseudotsuga sinensis, Cephalotaxus fortunei, and broad-leaved trees, e.g. Betula albosinensis, Acer spp., Sorbus spp. Quercus spp., and Magnolia spp. Tsuga forrestii remains in most places a minor component of the forest (Wang 1961). Forrest's Hemlock is a timber tree used for construction, aircraft, furniture and as props for mines. This species is present in several arboreta in Europe and North America, almost exclusively from early 20th century introductions made by the famous 'plant hunters' of the time. 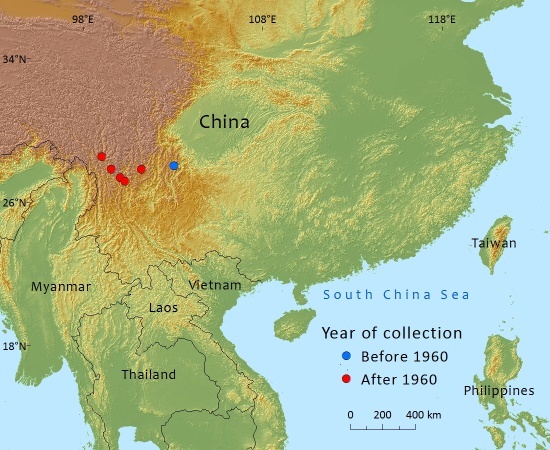 Although there is no direct information available, it seems reasonable given what has happened in this part of China to suspect a 30-49% population reduction in the past three generations (60-75 years) as a result of direct exploitation of the species for its wood and also because of general forest clearance for timber and expanding agriculture. The species is therefore listed as Vulnerable, but could well qualify for Endangered if more information were available on the degree of population reduction. The reduction has now been reduced significantly by the logging ban imposed by the Chinese Government in 2001, but illegal exploitation may well be continuing at a low level. 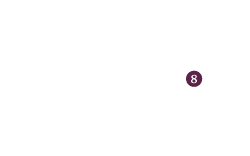 This species has a limited range separated into two or three disjunct areas. Deforestation and logging have substantially reduced the area of occupancy (AOO) of this species. The Government of China has recently imposed a ban on logging in China. This species occurs in a few protected areas. Cun, Y.Z. & X.Q. Wang 2015. Phylogeography and evolution of three closely related species of Tsuga (hemlock) from subtropical eastern Asia: further insights into speciation of conifers. Journal of Biogeography 42:315-327. Havill, N.P., C.S. Campbell, T.F. Vining, B. LePage, R.J. Bayer & M.J. Donoghue 2008. Phylogeny and Biogeography of Tsuga (Pinaceae) Inferred from Nuclear Ribosomal ITS and Chloroplast DNA Sequence Data. Systematic Biology 33(3):478-489. Wang, C.W. 1961. The forests of China with a survey of grassland and desert vegetation. Maria Moors Cabot Foundation, Harvard University, Cambridge, MA. Wu, Z. and Raven, P.H. (eds). 1999. Flora of China: Vol.4. Cycadaceae through Fagaceae. Science Press (Beijing) & Missouri Botanical Garden (St. Louis). Yang, Y. & Luscombe, D (2013). Tsuga forrestii. In: IUCN 2013. IUCN Red List of Threatened Species. Version 2013.1. <www.iucnredlist.org>. Downloaded on 12 July 2013. P.Thomas,Y.Yang,and D.Luscombe, 2015. Tsuga forrestii, from the website, Threatened Conifers of The World (http://threatenedconifers.rbge.org.uk/taxa/details/1048).